Three is Two on steroids. Three is all grow-en-ed up, thank you very much. Apparently Three is also stealthy. Three crept out of his bedroom in the dead of night. Let himself into the study. Rifled through drawers. 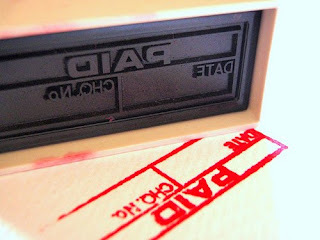 Found a self-inking gadget. And Three stamped PAID all over everything. LMAO! now it's even worse threes? My mother always told me we had to make allowances for my brother - "he's at a difficult age". He's 41 now. See if you can get him to print money next time! Wishing you strength and fortitude! Ha ha! With all three of my children I thought threes were the worst!! Two was CUTE - three was BUSY and MOBILE! Their little brains don't really calculate cause vs effect yet! Oh no. What a lovely surprise you must have gotten walking in and seeing that. Perhaps this is a future calling for him? Agreed. 3 is the new 2 around here. Haven't you heard the saying 'The F**KED threes'?? Oh yes, terrible two's aint got nothin of threes, but wait till four!!! I've awarded you a circle of friends award. I'd love for you to accept it. Pop on over to check it out. Yup. We had worse threes than twos around here. We had stamps, too, unfortunately. No! I wont hear it!! Two is as bad as it will get in this house thank you very much!!! Oh. We have found that (whispers..) four is, ahem, special too. 'Don now Mummy - down zere - in hole. Bye bye' (points to hole in bedroom floorboards). In the future archaelogists will excavate beneath the hole and find many interesting things. No way! What a nightmare! Oh dear. How much fun three must have had. Perhaps you can teach him how to do useful chores during the night. hahahohoHO NO! That's so bad, it's almost funny. We're living with three here too. Ain't it grand?